Serving as the keynote speaker for the Executive Leadership Foundation’s 21st Mid-Level Manager’s Symposium (MLMS) on Oct. 7 and 8, Carla Harris spoke to the room of nearly 800 black professionals about the powerÂ of owning your career and the importance of establishing meaningful relationships. “There is one person that has responsibility for your career, and that is you,” she told the audience at the Gaylord National Hotel and Conference Center in National Harbor, Maryland. 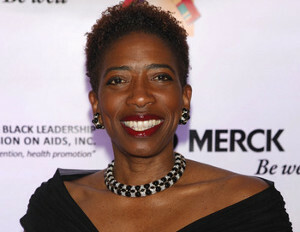 Following her remarks, Harris, who is a speaker, author and Morgan Stanley executive, spoke to BlackEnterprise.com aboutÂ the importance of events such as MLMS, the value of setting boundaries in the workplace, and advice she would give to her younger self. BlackEnterprise.com: Why is it important for events like MLMS to exist? Harris: I think one of the most important things we can do is pass on our intellectual and spiritual DNA to the next level of leaders. There is so much information you can get from these leaders, but to hear from the people who are already traveling on the journey you’re on is valuable. Also, to pass on the tools on how to navigate these organizations and decisions is critical because that is information you normally don’t get. We know success is not just about being smart, it’s about also having the tools to be able to navigate. What advice do you have for those who struggle with setting boundaries in the workplace? I think it’s about how you message who you are. For example, from the very beginning [of my career] I would say from 9-11 a.m. on Sunday I won’t be here, and there was never any issue because I delivered and people knew that time was important to me. So it’s important for you to deliver the message of who you are, but to also realize you have a job to do and you can’t drop the ball. One of the pieces I always think about when asked this question, is when I had a senior executive who would say to me, ‘Remember you can be frequently wrong, but never in doubt.’ The context of that was being confident in giving an answer even if you’re not quite sure. She said my problem was [that] if I didn’t know something, I would wear it on my sleeve and she said that’s not good because people pay you for your expertise. That did not sit well with me at first because I like talking about things I feel very sure of, but I took her advice. Never did I put out something that was completely wrong, but I would say, ‘I think the answer is x but let me double check on that.’ I would leave myself the room to go back and check, but at least I would allow myself to answer it at the time. What advice would you give to your twenty-something self?